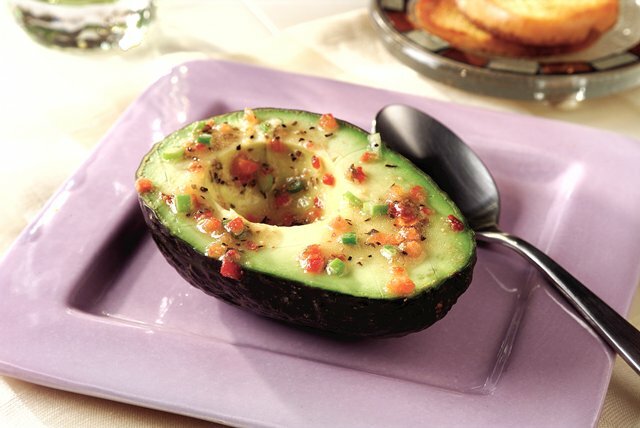 Got ripe avocados on hand? Make them taste even better in this simple avocado salad. Give this incredibly easy Quick Mexican Avocado Salad a try. Mix dressing, onions and crushed red pepper. Place 1 avocado half on each serving plate. Drizzle evenly with dressing mixture. In addition to brightening up your plate, this easy-to-make side salad also makes a great accompaniment to a serving of cooked lean meat, fish or poultry. Brush some of the dressing mixture onto cut sides of avocados as soon as they are cut to help prevent them from turning brown. Score flesh of each avocado half, being careful not to cut through the peel.